I have been obsessing over leather recently. OBSESSING. But my shopping moratorium has limited my ability to buy anything, let alone leather. I saw this Iris and Ink shirt a few weeks ago on Refinery 29. Gorgeous, and not too expensive at $230. So, I decided to save for it. As luck would have it it’s been pretty mild in D.C. for the last few weeks, so I haven’t needed AC or heat. Boom. Pepco money has been redirected to the shopping budget, and it just increased by 50%! Hallelujah! BUT, my plans were foiled. The stupid top wasn’t available when I went to purchase it. GRR! I wasn’t going to let that deter me though. 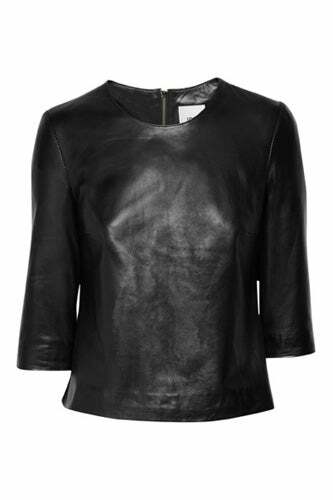 I’ve already planned out several new outfits with my new leather top. The horse is officially out of the barn, and I’m making this happen. Next stop was ShopStyle.com, where I looked up other leather tops. Whaddaya know? There are TONS. I ended up buying this one from Lord & Taylor, and I’m in love. It was originally $174, but reduced to $129.99. And a quick search of RetailMeNot.com revealed a coupon for 25% off any purchase from L&T, bringing my total to $97.49. BARGAIN.